OMAHA, NE. November 20, 2017 – The most famous traveler in the world will become a new fixture on Holiday Island during the kickoff of Omaha’s Holiday Lights Festival. 20 ft. high Santa-in-the-box will join the other Holiday Island decorations that fill the island in the Gene Leahy Mall. 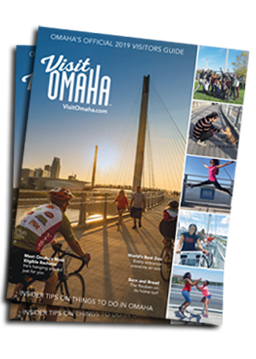 Visit Omaha, Omaha’s Tourism Authority, created Holiday Island last year as a way of thanking the local community for all it does to welcome and entertain the 12.3 million out-of-towners who visit the city every year. Installation of Holiday Island begins Nov. 20, 2017 and is expected to take two days. Decorations will remain through the first week of January 2017. Everyone is encourage to check out Holiday Island and share their photos with #OmahaWeekend. Go to VisitOmaha.com/HolidayIsland for ideas on fun things to do throughout the holidays with visiting friends and family. Visit Omaha partnered with Clark Creative Group and Heartland Scenic Studio to create and install Holiday Island.